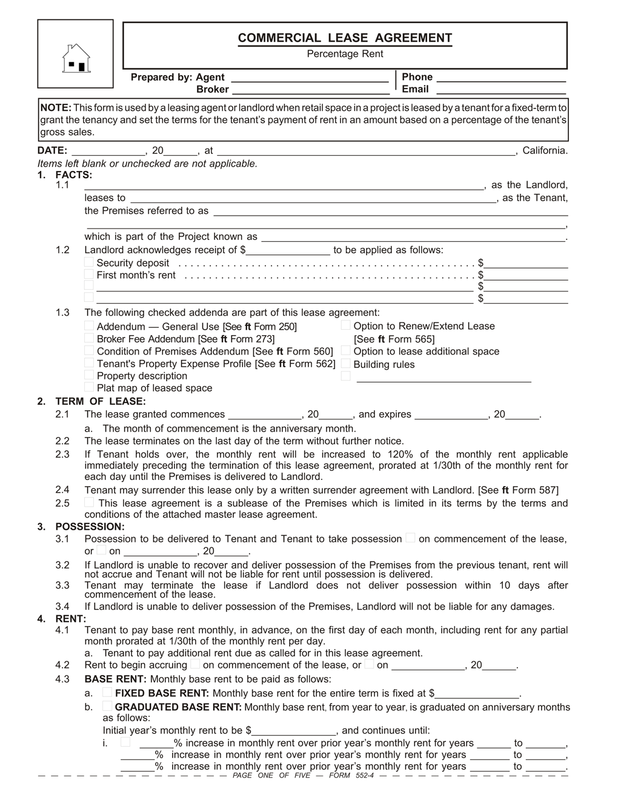 Download the Form This form is used by a leasing agent or landlord when retail space in a project is leased by a tenant for a fixed-term to grant the tenancy and set the terms for the tenant’s payment of rent in an amount based on a percentage of the tenant’s gross sales. Leasing agents use commercial lease agreements in transactions involving industrial, retail, office and other types of commercial income-producing property. The forms are prepared by the leasing agents to document the rent and maintenance arrangements negotiated between the owner and the tenant. Rent received by the owner from leased space is income on the capital invested in the real estate. Conceptually, rent is economically similar to a lender’s receipt of interest for the use of money loaned. In both scenarios, the property and the money lent are both returned at a future time. Like interest rate provisions in a note, rent provisions in a commercial lease agreement are structured to anticipate future market changes that affect the investment (value, income, expenses and mortgages). Fixed-rent leases do not anticipate future changes in the investment’s fundamentals. However, variable- or adjustable-rent leases do anticipate market changes. Properly structured, variable- or adjustable-rent leases shift increased costs to the tenant and positive demographic influences to the owner by way of a related increase in rent. To accomplish this feat, the owner selects rent and use-maintenance provisions for a lease agreement that will deliver the maximum net operating income (NOI) through the life of the lease. In the course of negotiations, the owner wants to captures the future benefits of the local market in the rent schedule agreed to. This is the only method for staying in line with price inflation and demographic-driven appreciation. Net income from an income-producing property’s operations sets value and thus pricing. The owner’s attention to shifting future cost increases to the tenant and capturing positive demographic changes brought on by the property’s location further enhances future value. These objectives are sometimes overlooked in times of economic recessions in a desperate effort to get vacant properties rented before the market has recovered. the absorption or pass-through of increased operating expenses and interest adjustments on mortgage debt. The percentage rent provision in a commercial lease agreement is conceptually very different from other provisions for calculating rent. Percentage rent provisions are used exclusively by owners of income-producing properties who rent to retail businesses. Percentage rent provisions override a similar financial outlook presented by the use of periodic market-rent adjustments provisions in industrial or office properties which are based on comparable rents. Percentage rent provisions rest on the inherent quality of the location and ability of the tenant (and landlord) to drive up the tenant’s total revenues at the premises. Percentage rent provisions are calculated using a formula calling for an amount of additional rent to be paid separately from and in addition to the monthly base rent, called percentage rent or overage rent. Percentage rent due is typically calculated as a percent of the tenant’s annual gross sales, less the amount of base rent paid monthly during the year. When the point of crossover between owing only base rent and incurring overage rent is the same, the percentage rent provisions is called a natural breakpoint arrangement as used in our example below. Depending on the owner’s or the tenant’s superior bargaining strength (location versus tenant’s brand), the percentage rent is occasionally negotiated to kick in before or after the natural breakpoint — the point at which the base rent equals the percentage for commencement of percentage rent due. the additional percentage rent provides the owner with a return on their investment based on the contribution of the property’s location to the tenant’s operating success. The additional rent is triggered when the tenant’s gross income from sales exceeds a negotiated dollar threshold (the breakpoint). the price range of the goods and services to be offered by the tenant. The owner then negotiates with the tenant to set the percentage of the tenant’s annual gross sales for calculating the additional rent. With a natural breakpoint, when the percentage amount exceeds the base rent paid, the tenant pays the excess amount as additional rent. the durability of the tenant’s financial strength. Consider a lease agreement calling for a base rent of $60,000 per year ($5,000 per month). The percentage rent provision calls for the payment of rent equal to 6% of the tenant’s gross sales. The tenant pays rent monthly at the base rent amount. Any balance due as additional rent is calculated annually on a final accounting. Thus, the landlord and tenant have agreed to a natural breakpoint. $30,000 in additional percentage rent, paid within 30 to 60 days after the end of the lease year. To keep the property’s base income — and its value — from losing ground to consumer inflation when percentage rent is not earned, the base rent needs to be adjusted annually. To make the adjustment to base rent, a graduated or inflation-adjusted rent provision is included in the lease agreement. a percentage of the base year rent or rent paid during the previous period. the tenant’s evolving use of the premises and its burden on the property and improvements. Rather than being tied to a formal index, the rent increases set by a graduated rent provision are negotiated. No paradigm exists other than the expectations of future consumer inflation under anticipated monetary policy. However, increases of 3% are customary in some markets. For the owner, graduated rents often provide an increase in rents exceeding reasonably anticipated inflation (the 2015 10-year bond market indicates less than 2% annually for a decade). Graduated rental rates are also put to use as teaser rates to attract very desirable tenants, or during periods of high vacancy rates and recession-like rents to adjust rents to market over a three to five year period. The CPI-U is an index of fluctuations in the dollar price the local population pays for consumable goods and services which includes residential rental rate changes. An owner’s use of CPI-U figures to adjust rents recovers the dollar’s annual loss of purchasing power to pay for goods and services the owner acquires with rental income. Occupancy of property is the service which the owner delivers and is consumed by the tenant using dollars to pay rent in exchange. state the month payments begin at the adjusted amount (e.g., anniversary month for the commencement of possession under the lease agreement). A good practice is to use CPI-U figures for the third month preceding commencement of the lease to compute periodic adjustments. Using a CPI-U figure for the third month prior to the adjustment guarantees an actual figure is available with sufficient time to calculate the rent adjustment and timely inform the tenant of the adjusted rent amount. Long-term commercial lease agreements need rent provisions which capture from year to year the financial benefits these conditions create for property owners (and tenant businesses). For an owner to garner the value of evolving local economic conditions, an appreciation-adjusted rent provision is included in commercial lease agreements. Through the provision, it is agreed the base rent is adjusted every three to five years to capture any increase in rents brought about by the economic effect of local appreciation, increasing rents beyond any graduated or inflation-adjusted increase in base rent. In areas experiencing significant growth, the longer the lease term, the more likely an appreciation-adjusted rent provision will be negotiated and included in the lease agreement. Appreciation-adjusted rent provisions work in tandem with the inflation-adjusted rent provisions. The inflation adjustment is annual; the appreciation adjustment takes place every three to five years. 23.9 Notice: Landlord has actual knowledge the property is located in a special flood hazard area or an area of potential flooding. Tenant may obtain information about flood and other hazards at http://myhazards.caloes.ca.gov/. Landlord’s insurance does not cover Tenant’s possessions. Tenant may purchase renter’s insurance and flood insurance to insure their possessions from loss. Landlord is not required to provide additional information about flood hazards beyond this notice. additional percentage rent calculated as a percent of the tenant’s annual gross sales, less the amount of base rent paid monthly during the year.